Having just picked up our take-out Thai for dinner I was headed home, ready to relax on the patio after a long day at work, when I saw it. WAIT! What is that? 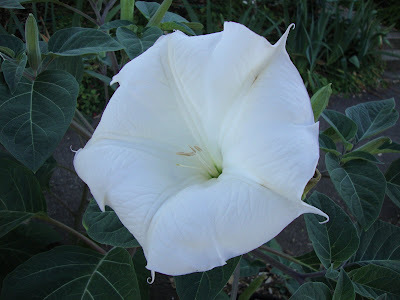 Out of the corner of my eye I spotted a huge white flower. Instinct was to slam on the brakes to get a better look. Luckily the sensible driver in me (who knew I had one!!!?) continued on and went back around the block. 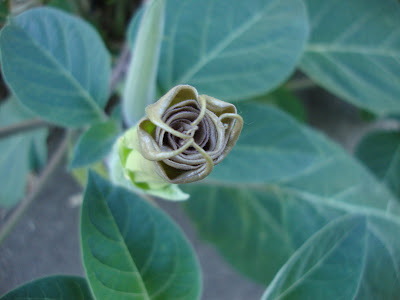 The new blossoms about to unfold had a great tobacco stained coloring. 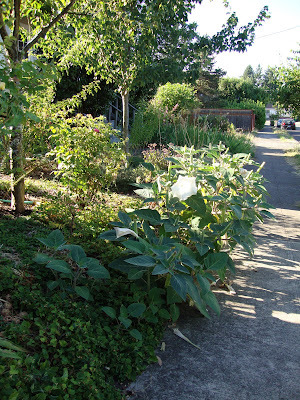 The odd thing was there were several plants scattered along the sidewalk. The sort of planting you usually see when a plant self-sows. 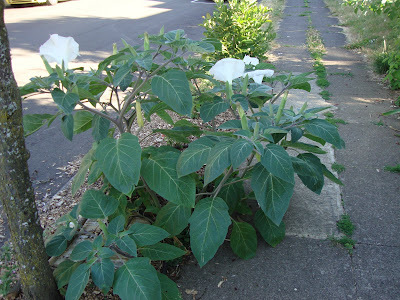 I was so fascinated with the possibility that this plant might have actually made it through a Portland winter, to multiply on its own, that I went and knocked on the door (yikes!) I needed to know more. Unfortunately nobody was home, or maybe they could see the excitement in my eyes and were too afraid of me to answer the door! No worries, I will be back…this is too good to not know more about it! you crack me up Miss Danger!!! :) fun find! 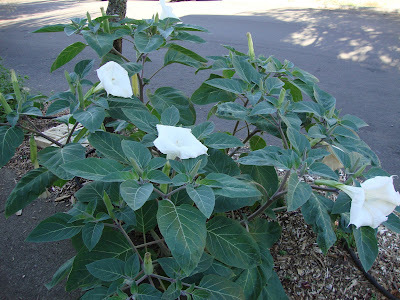 I'm going to guess Datura: the foliage looks like the ones I saw in Joshua Tree. They grew up close to the rocks where rainwater ran down (when there was any.) 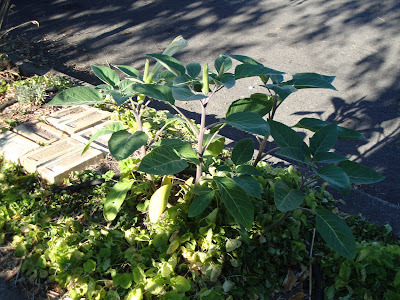 They are strange and stately plants. Just don't eat 'em. Speaking of eating, I bet your Thai food needed a warm-up by the time you got home! 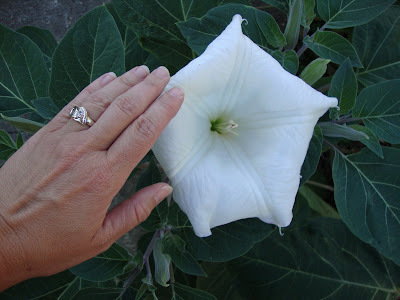 The seed pods on the Datura are spectacular, and produce voluminous amounts of seed. You can probably snitch a few when the time comes. I grew several from seed and they turned out well, but did not reseed naturally. I have some saved seed from that experiment tucked away somewhere. If ever I run across them, I guess it would be a good idea to start a new batch. I have been enjoying your writing 'voice' as much as the pix and the subjects, so added you to my blogroll. Fun to see what gardeners are doing around the world, but even more so to share thoughts close to home. 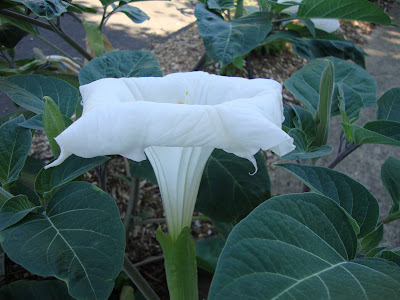 It sure looks like a datura. They self-sow freely around Austin. I hope they'll do the same for you! 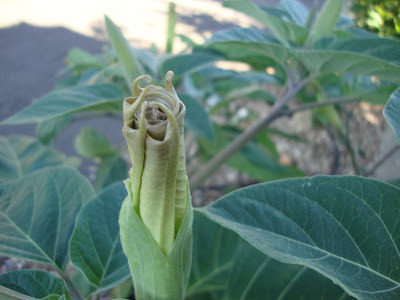 I never know the difference either, but sounds like datura it is. I got either one of those or brugmansia and have been too big of a slacker to look back at the tag, Who knee they grew easily from seed. I guess that should go on next year's to-do list. The size is awesome for a relatively young plant isn't it? Love this big bells, they look so lovely. Glad that you detoured and snapped these shots ;-) Have another wonderful day yeah. Jane, I would never have guessed they could grow in such harsh conditions as Joshua Tree. Funny...yes there was a little heat-up of the cooled down Thai. Ricki, thanks for the info, good to know and I will definitely happen by to collect a few seeds and hopefully talk with the owner. And thanks for the kind words, I am honored! Pam, it's sounding like maybe not...but I am going to try! Megan, I hope to collect some seeds from this plant, I'll share! Stephanie, they were amazing! As usual my photo skills didn't do them justice! I grow these daturas all the time. Let me know if you need any seeds, I can send you plenty! It's one of my favorite annuals. Dee, interesting! Oklahoma? I never would have thought! K & V, thank you for the generous offer. I'll see if I can get any from this plant(s) and if not be tracking you down to take you up on it!